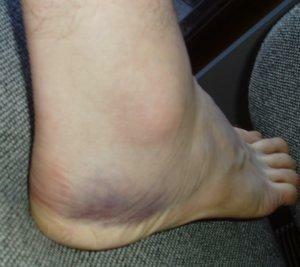 Not really IT related, but I sprained my ankle playing basketball on Saturday. 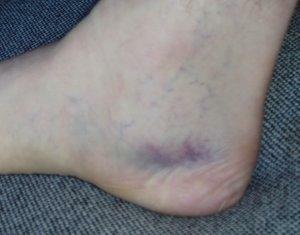 This how my foot is looking 3 days on: Nice bruising huh? Last time I did an ankle badly, it was before I was married. It is a bit different when you've got two kids and a wife now! MetaBuilders - Web Tools ComboBox Control" I've made previous use of the RowSelectorColumn control with an ASP.NET project, and just noticed today their "ComboBox" control - something you can't do with plain HTML. Download details: Shared Computer Toolkit: "Microsoft Shared Computer Toolkit for Windows XP (Beta) Powerful new software tools for shared computers in classrooms, school computer labs, libraries, and public places. The Microsoft Shared Computer Toolkit for Windows XP helps make it easy for anyone to set up, safeguard and manage reliable shared computers." The Code Project - RSS 2.0 Framework - C# Programming: "RSS 2.0 framework implements the RSS 2.0 specification in strongly typed classes. The framework enables you to create and consume valid RSS 2.0 feeds in your code in just a few minutes." I am not a legal expert, but I found this commentry in The Register interesting - it seems to imply that someone has been charged in Australia for having a web page that linked to another site (not run by them) that hosted illegal content (audio files). Does this mean we'll have to keep a closer watch on where external links go to? feedmap .net (BETA) : Where Blogs Meet Maps: "Using FeedMap you can geo-code your blog, browse already geo-coded blogs and search for blogs. Once geo-coded, you can get your own BlogMap location using a simple url that allows you to network with your local bloggers and much more!" I'm surprised I hadn't mentioned this earlier. Microsoft TechEd 2005 is at the Gold Coast from August 30 - September 2nd. Three days of presentations and sessions, and a new location this year too. These little bloggers went to market - Technology - smh.com.au: "These little bloggers went to market" I've just had a week's holiday in Sydney, and while I was there I read this article in the Sydney Morning Herald's Tuesday edition (they have a small IT section a bit like The Australian does). It got me thinking about how "corporate" blogging might work at UniSA. Would it be embraced by staff, and what would students and people from outside UniSA think of it? Nikhil Kothari's Weblog : ASP.NET Development Helper: "ASP.NET Development Helper A little browser extension to provide a couple of tools for the ASP.NET page or control developer."